I have two SW44 switches to allow more than 4 ExpressVu receivers. 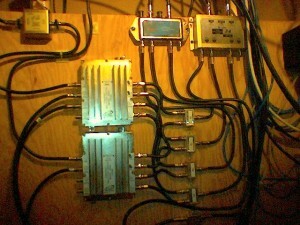 The two SW44 switches are connected together using satellite-grade (up to 2GHz) splitters. The splitters I used have one DC path. Make sure that the DC path outputs are all connected to the same switch (it doesn’t matter which one). The splitters then connect to a pair of classic 2×4 switches (sometimes called 3×4 because there’s a third terrestrial signal input, which isn’t used). Outputs 1 and 2 basically pass on the 13v and 18v outputs from the LNBs on the ExpressVu dish. 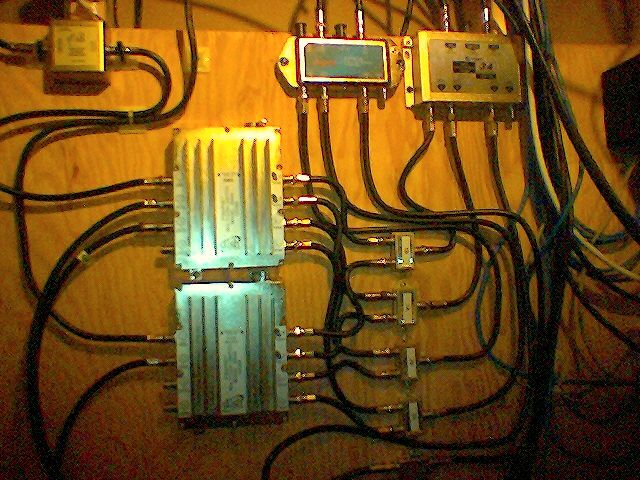 The third output from the switches, along with the line from the 119° dish connect to a DiSEqC switch. The DiSEqC switch then connects to the FTA receiver. That’s it! 46 F connectors and a box of wire later! Make sure you use good quality connectors and cable. This many switches and connectors will degrade the signal strength, so you need to make sure you’ve got as little loss as possible. In my case, the signal strength dropped from around 90 to just over 80. Still very acceptable.